Until the past few years, a Hawaiian Quilt was, by definition made in Hawaii, by Hawaiians, using traditional designs, materials and methods. Imitation and the unauthorized use of original designs was unthinkable in the Hawaiian community. 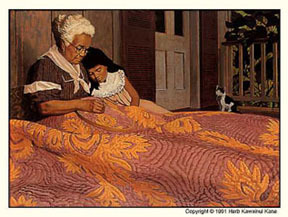 When quilt patterns were shared it was normally within the family or the Ohana (extended family group). Designs might be given away but were rarely if ever sold. Eventually some patterns did make their way into the public domain and were preserved in such places as the Waianae Library on Oahu where they were available for any quiltmaker to use. Some designers left a legacy of their patterns to a library for the enjoyment of all. One such is the Hannah Baker Collection. More recently, others have given their designs to quilt clubs with which they were affiliated, to be used and shared by all members. The making of quilts though remained uniquely Hawaiian. Tourists coming to the islands saw and admired the quilts in museums and homes. Contrary to custom some were sold by their makers and taken back to the mainland. Through these the knowlege of Hawaiian quilting as a unique art form, different and distinct from traditional American patchwork, gradually began to spread. The current Renaissance of interest in all types of ethnic Arts and Crafts has, for better or for worse, stimulated interest in all things Hawaiian. Replicas of Hawaiian Quilts can now be found in many places ranging from exclusive specialty shops to such outlets as Wal-Mart and Costco. In most stores they are labeled as "Hawaiian Style" quilts and their point of origin is clearly indicated. Sometimes, unfortunately this is not the case. Several well known and highly reputable designers own shops which sell quilts made overseas, usually in the Philippines. The designs are original and authentic, the workmanship is generally excellent, and the prices are lower than that of quilts made in Hawaii. There is only one problem. They are not truly Hawaiian Quilts, and there may be many made in any given pattern. "Hawaiian Style Quilts" are also now being mass-produced in Taiwan and Thailand as well as by less reputable manufacturers in the Philippines. The origins of these are more questionable. Some are replicas of older patterns available in libraries, some are new or altered designs by unspecified designers, and some are copied from photographs taken at quilt shows or from books displaying pictures of modern quilts. These are relatively inexpensive, far cheaper than anything made here in Hawaii. In some, the quality is acceptable, among others the material is often shoddy and the workmanship very poor indeed. Let the buyer beware. The logical question is why do not designers copyright their patterns? The answer is that many of us do. This provides safeguards against unauthorized "borrowing" and use of patterns on a local and even a national level but offers little or no protection from anonymous overseas manufacturers. Copyright infringement, plagarism and pattern theft continue almost unhindered by threats of legal action. Rarely does a designer know that his or her pattern has been duplicated until an unauthorized copy is displayed and offered for sale. Even more rarely is it possible to determine when, where and by whom the design was copied and sold for overseas use. Genuine Hawaiian quilts are undeniably expensive -- a luxury item except for those who choose to make their own. It is for this reason that some of us -- by no means all -- now sell our original designs to those individuals who are willing to expend time and effort in using them. We anticipate that during the months it takes to make a quilt, they too will learn to love and appreciate this art form which we share with them. Aloha and Mahalo from Honu to all who visit my home. This Hawaiian Ring site owned by honu_hale.